As I had discussed, it is irrelevant and illogical for the PAP ministers to dissuade Singaporeans from pursuing a university degree, when the outcomes of being a university or polytechnic graduate is immense – the starting pay of university graduates is $3,000, while that of a polytechnic graduate is $2,000. But, how does their starting pay compare with the other high-income countries? 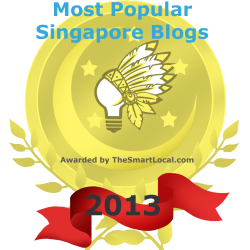 Perhaps things are not that bad for Singapore, we might think? Let’s take a look. For the first comparison, the starting pay for university graduates is taken to be $3,000, and that for polytechnic graduates is at $2,000. I will use the estimate of $1,300 for workers with upper secondary or post-secondary non-tertiary education, and $800 for workers with below upper secondary education (Chart 1). When you compare the starting pay of workers of the different education levels in Singapore with the other countries, you will see that university graduates (dark blue bars) in Singapore earns the highest wages relative to someone with a below upper secondary education (grey bars) (Chart 2)! 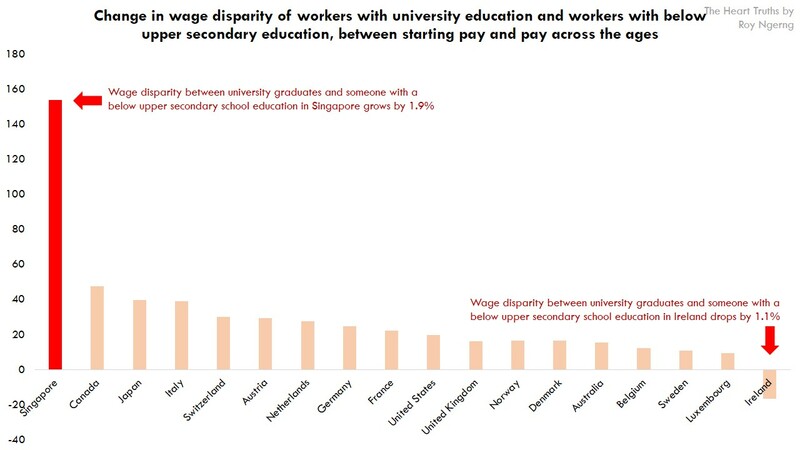 In fact, the disparity in wages between a university graduate and Singaporeans with a below upper secondary education is the widest among the high-income countries (Chart 3)! But how does wages grow (or not) over time? 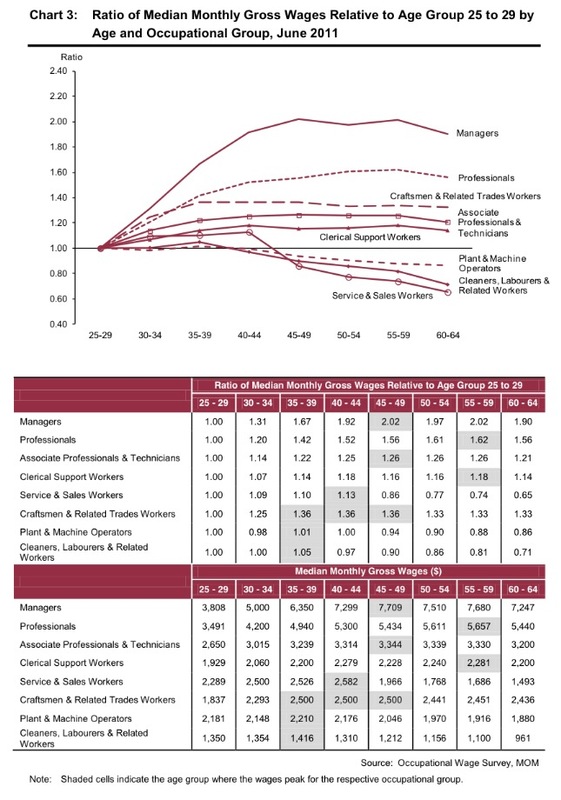 As I had discussed, the pay of a polytechnic graduate, and that of someone with post-secondary education and below upper secondary education, is likely to stay stagnant or decrease over their lifetime – for workers who earn a starting pay of $2,000 or below, you can see that their pay would stay stagnant or decline over time. However, for a university graduate (someone who earns $3,000 and above), their pay is likely dramatically increase – the pay for a person who earns $3,000 rises over time (Chart 4). As such, to look at the next comparison, we can assume that across the different age groups, the median wage for a polytechnic graduate will remain at $2,000, but for a university graduate, the median wage would increase to about $5,000, as an estimate. Workers with post-secondary-educated workers will also see their median wage remain at $1,300 and that for below upper secondary education, it will also remain at $800 (Chart 5). Thus when we look at the comparison of the wages of Singaporeans with the other countries across the age groups, once again, we would see that university graduates (dark blue bars) would earn a higher wage, relative to someone with a below upper secondary education (grey bars), and not only that, the disparity widens – because university graduates are most likely to be the only ones who will see significant pay increases over their lifetime (Chart 6)! 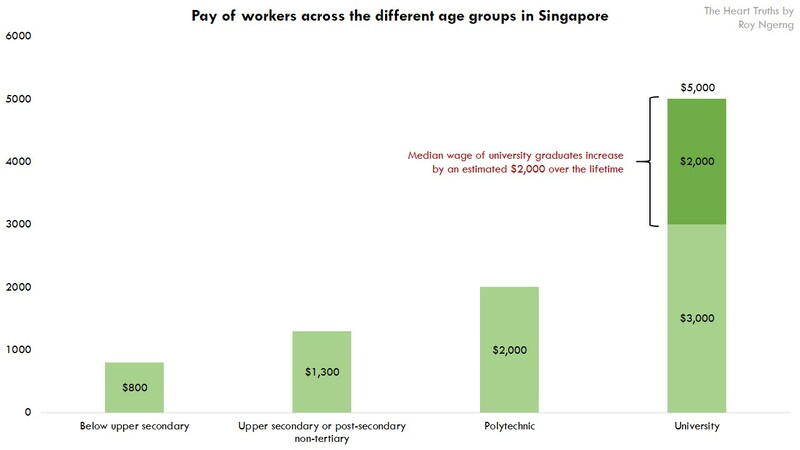 And again, across the age groups, Singapore shows the widest wage disparity between a university graduate and someone with a below upper secondary education (Chart 7). Not only that, this wage disparity has also seen the fastest rise between the starting pay and pay as the workers age, among the high-income countries (Chart 8). And if we compare the wage disparity between a university and a polytechnic graduate, the disparity is also the highest in Singapore (Chart 9). Are you flabbergasted by the severe wage disparity in Singapore? 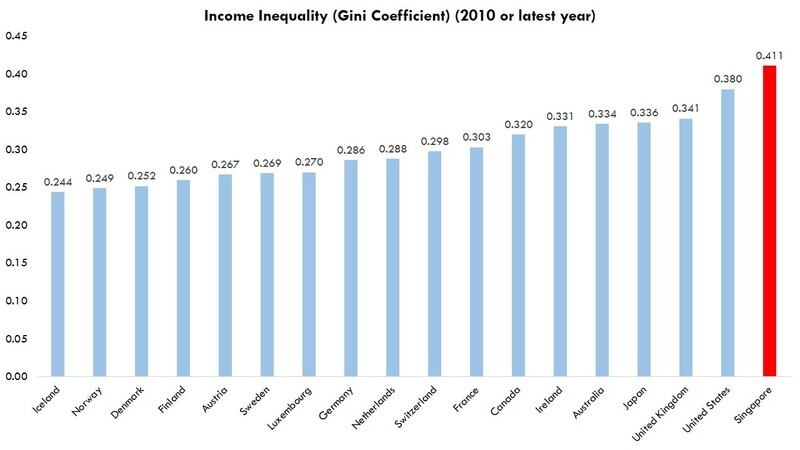 Now, do you know why Singapore has the highest income inequality among the high-income countries (Chart 10)? 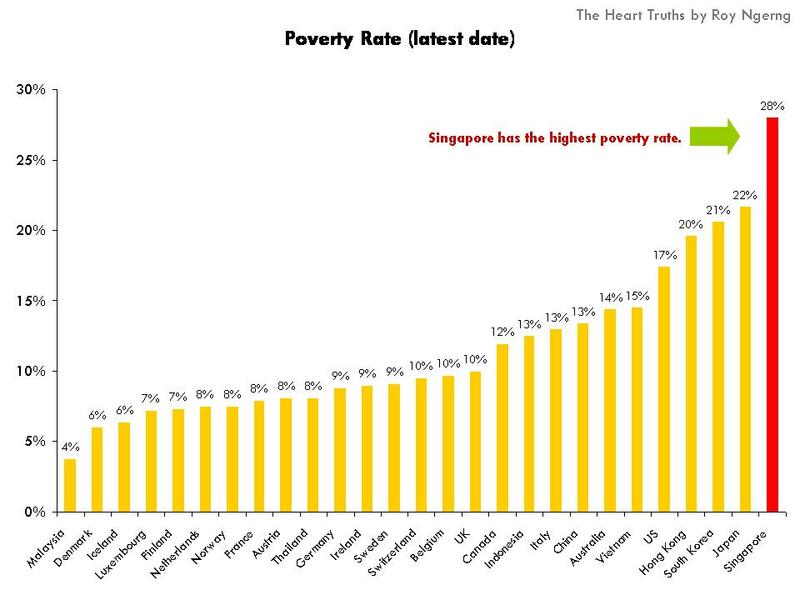 And because low-wage workers are paid the lowest wages, Singapore also has the highest estimated poverty rate among the high-income countries, and even countries in the region (Chart 11)! 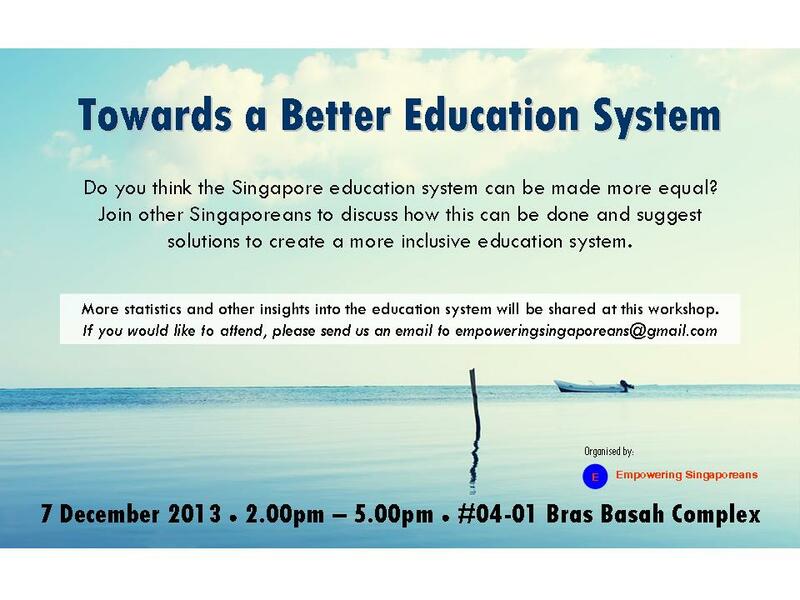 The question we have to ask is – why are the wage levels in Singapore pegged so closely to the educational levels? But perhaps the more important question to ask is – why are the different educational levels of such differing “standards” that the wage for the different educational levels are so distinctly separate? Is this a policy decision to alleviate the status of a university education, while delineating that of a polytechnic education, and even further marginalising those without either a university or polytechnic education? Again, PM Lee might have said that, “every school is a good school“, but why are the so-called-“equally”-good schools created with such differential standards, and consequently pay the graduates so differently? Or are these differential standards a policy decision to segregate Singaporeans? 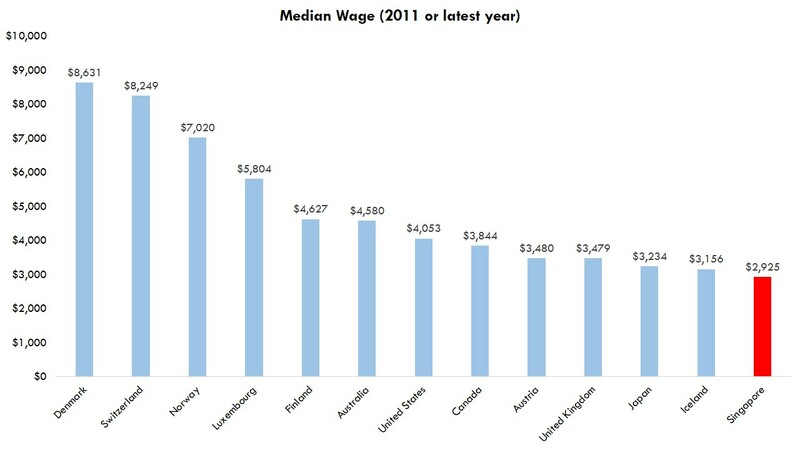 But what’s more – do you know that Singapore already pays the workers here the lowest wages (Chart 12)? That means that for a low wage worker, he or she would be paid the worst among all the high-income countries. Not only that, the wages of university graduates have also been depressed in Singapore. The problem of wage depression is thus one that strikes all Singaporean workers. So, the final question we have to ask ourselves is – why are the other countries able to pay more equitable wages for their workers? Why are the workers in other countries more equally valued than in Singapore? Also, why do workers with equivalent educational qualifications in other high-income countries paid higher wages than Singaporeans as well? Mind you, Singapore has the highest GDP per capita, so why is it that poorer countries are able to pay higher wages to their citizens, but Singapore cannot? As I had written about, the wage inequality that persists in our country is one that has its roots in the education system – our people are divided early on in life into the different educational pathways that the system has deemed them to fit, and this carries on until later on in life, where they continue to be stuck in their fixed roles and earn a predetermined salary. However, does a government – any government for that matter – has a right to predetermine or decide how the abilities of its people should be destined? Should the PAP government sculpt the system to such an extend that the role that we are conferred with early on in life would predominantly stick with us for the rest of our lives? Why did the PAP government operate with the planning parameters that sees it necessary to demarcate schools in unequal terms, and to have such unequal wage patterns? If so, is “every school (truly) a good school”, or is this only lip service? Singaporeans have a right to know the planning parameters that the PAP government uses in planning our education system and job market. Singaporeans have a right to know why our education system has such unequal outcomes, and why our wages are also so unevenly distributed. If most Singaporeans are asked if they believe that such inequality should exist in the system, the most likely answer would be an affirmative, “NO”. Indeed, is it in Singapore’s and Singaporeans’ interest to continue to see such widening inequality in Singapore? Is it in our long term interests to see such an unequal education system and job market pull our society apart, which can lead to intangible problems down the road, of distrust among the people, and a sense of disempowerment for Singaporeans who are seemingly left behind? Fark the PAP that’s why. I have to agree that shortening the income gap is a one of the goals we as a country should try and achieve. However, is it so simple as to blame the PAP and government for this? The job market is a free market no matter how you look at it. Private companies employ who they want at rates which that they set themselves, not what the government tells them. If a company wants to pay a citizen a lower rate then the government cannot intervene, it is up to you if you want to take up to job or not. Sure, the government can influence, but to what extent? The government doesn’t send out emails telling private companies to pay poly grads 2k and uni grads 3k. Its up to the companies to decide how much their employees are worth. No, it does not. And our government has not done so. What they have done is put a meritocratic system in place. The person who determines where you end up in the system is yourself. Work hard and get to the top and you will earn more. Don’t work hard and it is unsurprising that you will fall to the bottom. The government doesn’t go around and say ‘you become technician’, ‘you become pilot’, ‘you become taxi driver’. Those choices are made by the individual. If you want to be a doctor then study harder and get there. Granted, the system itself is flawed in the way that it is not very supportive of those who are talented in the fine arts and sports. But that reflects what society requires of us. If the job market can support 1000 engineers and 1 artist, the government can’t change that. They can’t say, ‘everyone can be artists’ and then these people get sore when they find out that there is no market demand for them. It does not stick with us. We can change. I’ve seen ITE students end up in local uni. I’ve seen JC students flunk their 2 years and end up back in poly. Who says that wherever we are sent to post-secondary school will determine our pay scale? We all have the ability to work harder for what we want. But yes, Singaporeans are paid quite little as compared to other developed nations. But that may be because the perception of Singapore is that we are Asian and hence, cheap. Price-wise, Singapore is always competing with Hong Kong. Our tax rates are always pegged to theirs, we can’t go higher because then companies and investors will go to HK instead of staying here. 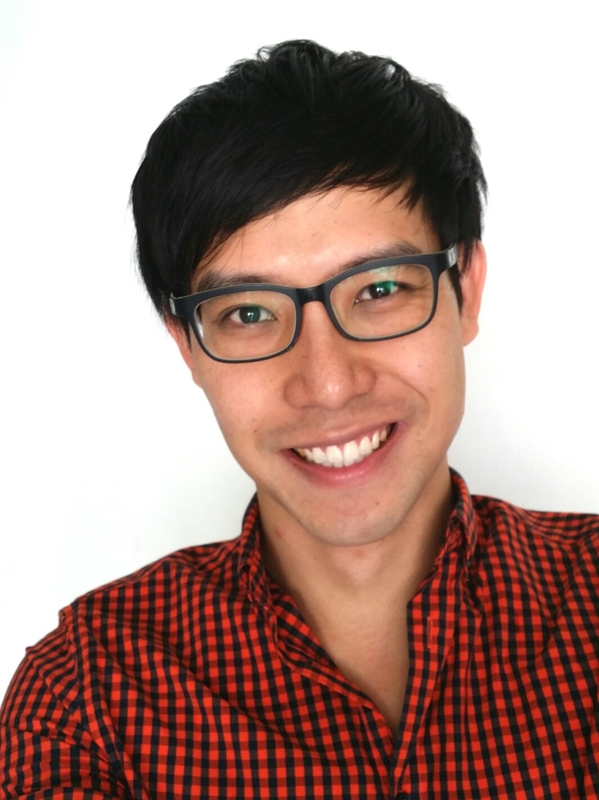 Singapore doesn’t have anything to lure companies with, other than, our only resource: people. Our people, sadly, must stay cheaper than western countries in order to lure them here. But if you look at it regionally, we easily earn twice, or even thrice as that of our South-East-Asian counterparts. What policies would you implement such that we can both lure multinational companies and at the same time raise wages across the board? I think one other thing that should be researched on is the number of poly graduates that eventually pursue a degree. Most of my poly friends, actually all of them, eventually start pursuing a degree within 0-2 years of graduating or completing NS. So would they fall under the degree category or the diploma category? Diploma grads, in my opinion, rarely stay at that educational level. Be it being sent for degree courses by their own companies or pursuing it themselves, most of them end up getting a degree nowadays. What does “below upper secondary school” mean? Clearly not every school is equal cos not every teacher is dedicated. The severe wage disparity is terrible! You do realise that its almost impossible for anyone who is still in school right now to not complete secondary education right? In fact, the first batch of students under the Compulsory Education scheme would be in the work force and have completed their poly education by now–if they went through the ITE route. Those who went through the JC route or went straight to poly after secondary school would have also been in the last years of their university degree. It’s not accurate to compare the wages of people who have never completed secondary school due to poor economic/ family conditions from pre-war/ post-war times to fresh university graduates of today with different qualification expectations and different economic standards. Maybe if you fact check and compare the starting salaries of students from each particular batch, then it’ll be a more convincing argument.